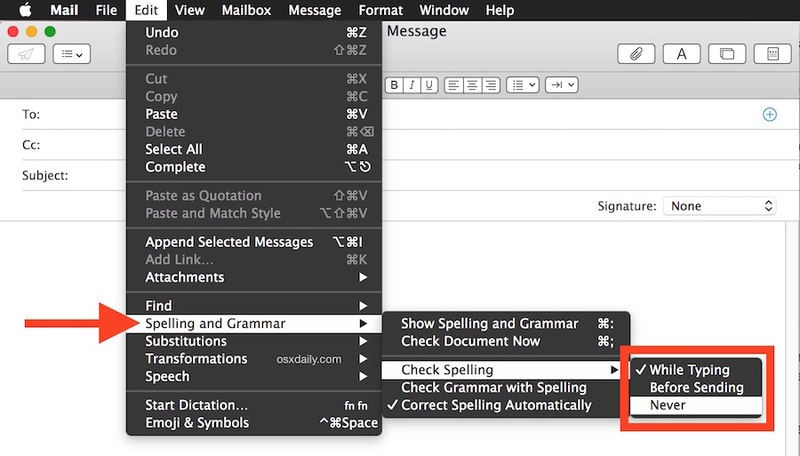 disabled auto-correct in OS X, an automatic Spell Check function continues to persist in the Mail app of Mac OS X. For users who are confident in their spelling abilities, bothered by the spell-check function, or who are just tired of correcting the auto-corrections in their outbound emails, you may find it helpful to completely disable the spell check feature in Mail app on the Mac. There are two ways to access this setting, the quickest and easiest is through a menu bar item, though you can also unselect the spellcheck feature in the Mail app preferences for Composing if desired. This will turn off all spell check functionality in Mac OS X Mail app, regardless of what the universal system-level spelling autocorrect functionality is set to. With this disabled, you can still opt to manually check your spelling as needed. To do that, you can go back in the “Spelling and Grammar” menu and choose “Check Document Now”, or, with an active email composition window open, hit Command + ; (semi-colon) to instantly spellcheck that email. Though this may seem odd to have multiple levels of typographical error correction, there are actually quite a few Mac apps that have separate spell check functionality like this, which can override or overrule the system level auto-corrections or vice versa. This is quite similar to spellcheck in Safari and autocorrect in Pages and TextEdit, which is also separate from the universal auto-correction preferences in Mac OS X. If spell-check and autocorrect bugs you on the Mac, you may also want to disable it on the iPhone and iPad too, which is controlled by a system-level switch and does not require individual iOS app toggles like some Mac OS X apps do. Spell check on Mac is abysmal. Apple should be embarrassed. Over the years – and I email them on it – a misspelled word that on the Mac, Apple Dictionary hasn’t a clue – I always copy my misspelled word, paste it into the Safari URL bar – and Bing displays the correct spelling that Apple Dictionary hadn’t a clue of. Bing 100% of the time. I use to use Google and they too got it right 100% of the time. I’ve emailed Apple over the years on how they can correct it 100% of the time and at best, apple auto-correct is right 50% of the time to this day.No reply of course. I find that to be particularly true with medical terms and words with foreign origins, the Apple Dictionary could be expanded to improve on some definitions certainly. Technology follows the money. The Universty in Morgantown West Virgina had a small mag-lev train back in the 70’s. It has long be dismantled for scrap. Why? public funding went away. There are presently no mag-lev trains in the USA. The USA had passenger trains that could travel 100 MPH back in the 60’s. Where are they? If anyone thought there was a way to make money at it, then flying cars would have been common by 1995. Yea that’s sad but true, at least in the USA. Political ineptitude in the USA is degrading the USA and the nation is way behind others now. Meanwhile, if you visit the rest of the modern world, you find incredible infrastructure. Japan has amazing high speed trains which cruise at 200mph. A long trip to Singapore, Sydney, Melbourne, Oslo, and then a return back to the USA, makes you feel like you were in the future and then walked back in time 40 years. It would be funny, if it were not depressing. The USA is in dire need of major investment in public works and infrastructure, we were the shining jewel of the world in the 1950’s and 1960’s, and we’re still coasting on the same crumbling production with few improvements since. Oh, but on the bright side we do have very innovative companies that use the USA to build neat stuff that is built overseas and sold here and overseas. So, buy Apple products and live in Australia or Western Europe, I guess!?! In preferences for Dictionary, go to preferences and you can uncheck Apple dictionary if it’s active and choose from other dictionary like the New Oxford American Dictionary, or in my case, because I’m in Australia and we use British spelling, the Oxford Dictionary of English. Maybe by doing that you can get the correct spelling for your country. honestly it is not that bad. i find it enjoying that to spells color and labor with out U. but honestly how hard is it to correct its spelling. As a life long dyslexic the cup is so much fuller than half full. be grateful for your first world hardships. This tip is simply untrue. In Yosemite, if you do NOT turn off the universal OSX spell check, you will still get the annoying auto-correction in mail, even if it is turned off in mail. BOTH have to be turned off to get rid of this silly feature. OSx autocorrect is a pain in the be-hind. Screws up so badly when someone is trying to type in other languages or names. Why do we even need it in especially in the browser. This is a nightmare for dyslexics – have Apple no pity? I need my mac to identify misspelled words (as in Word, for example), but not to put randomly something else entirely that I never even began to type into my text instead. How am I supposed to spot these? We dyslexics spend huge amounts of energy trying to type and spell correctly, and we have massive trouble spotting errors. Slotting a new wrong word into place, and removing the helpful red line which would have warned us of an error is akin to bullying. If my boss did this at work I could get him sacked for harassment. How very dare Apple be so cruel? Sheesh. The bald-faced arrogance of these jumped up programmers, who think they know everything and actually are pig ignorant is astonishing. Who hired them? Back in the Big Cat days, Mail was good. Now it is a mine field. This is so ridiculous… All I want to do is turn off auto correct. A lot of words I write on a daily basis are model names, which do not have a “correct” spelling. However I still want to be able to see where I have misspelled actual English words! I want the spell check to still run, but not automatically change the words! I’m using Mail 10.3 on a late 2013 iMac running OS 10.12.6 and even when selecting “never” in “Check spelling” it autocorrects, which is especially annoying/dangerous when it autocorrects a proper noun like the name of the person you’re sending the mail to. Malcom, in addition to turning off the spell checker within Mail app, you might also try disabling autocorrect system-wide in Mac OS as discussed in the link below, it’s a setting within the System Preferences “Keyboard” section.